The ASME Code Section 8 is the construction code for pressure vessel and covers design, manufacturing and pressure vessel inspection and testing in the manufacturing shop. This Code section addresses the mandatory requirements, specific prohibitions, and non-mandatory guidance for Pressure Vessel Materials, design, fabrication, examination, inspection, testing, certification, and pressure relief. In this article you will learn about the different subsections and guidelines for the use and application of this code. For ASME Code Section 8 scope and boundaries, review the Pressure Vessel Definition article. You may know ASME Code Section 8 has three divisions. Division 1 covers pressure up to 3000 psi, Division 2 has an alternative rule and covers up to 10,000 psi and Division 3 can be used for pressure higher than 10,000 psi. 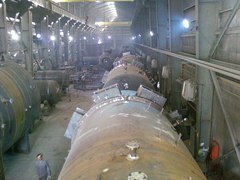 Mandatory application of ASME pressure vessel code is determined by rule and regulation at location of installation. For example, if you are living in the state of Minnesota, the application of ASME Code for construction and stamping is mandatory in your location, but if you are living in the state of South Carolina, it is not mandatory. These are the codes which are referenced from construction codes as explained in group 1. The ASME Section IX for welding and Section V for Non Destructive Testing are in this Group. For example, ASME Code section VIII for welding requirement such as WPS (Welding Procedure Specification), PQR (Procedure Qualification Record), Welder Performance Qualification, etc. refer you to ASME Section IX. These are the codes for in-service inspection after placing the equipment into service. The ASME Section VI for the heating boiler and Section VII are from this group. We have assigned a separate article for the NBIC, but as required for this article, the NBIC is making certification for ASME Authorized Inspectors and is also certifying R stamp for Repair services for stamped pressure vessels. This section is divided into three Subsections, Mandatory Appendices, and Nonmandatory Appendices. Subsection A consists of Part UG, covering the general requirements applicable to all pressure vessels. Subsection B covers specific requirements that are applicable to the various methods used in the fabrication of pressure vessels. It consists of Parts UW, UF, and UB dealing with welded, forged, and brazed methods, respectively. Subsection C covers specific requirements applicable to the several classes of materials used in pressure vessel construction. It consists of Parts UCS, UNF, UHA, UCI, UCL, UCD, UHT, ULW, and ULT dealing with carbon and low alloy steels, nonferrous metals, high alloy steels, cast iron, clad and lined material, cast ductile iron, ferritic steels with properties enhanced by heat treatment, layered construction, and low temperature materials, respectively. 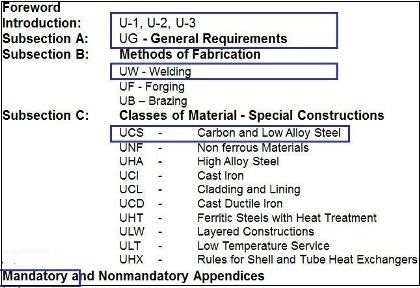 For example, if you need to manufacture a pressure vessel with SA 516 Gr.70 material (Carbon Steel), then you need to meet the marked items in above Fig. Please note that ASME Code Section 8, does not provide you fabrication tolerances except for misalignment and weld reinforcement. For example, for nozzle orientation, projection, elevation and other required tolerances there are no values in the code, and you may refer to pressure vessel handbooks for such information. Review the Pressure Vessel Dimension Inspection article for such tolerances. For example, ASME Code Section 8 Div 1 in UG-28 mandates all loading to be considered in pressure vessel design, but the method for calculation of all of them has not been addressed. For example, the formula for wind or earthquakes is not provided in the ASME Code Section 8, and these items and other similar loading considerations need to be designed by using the information provided in the pressure vessel handbooks. For ASME pressure vessel manufacture certification, as well as Authorized Inspection Agency certification, Review the Pressure Vessel Certification article. What is the Summary of Important Points in ASME Code Section 8 ? 1. ASME Code Section 8 edition is issued once every 3 years and addenda, once a year – both on July 1st. Edition and addenda become effective on the 1st of January of next year (i.e., 6 months after issue). 3. Longitudinal weld is more critical because it is subjected to double the stress than Circ. Weld. 4. “Weld joint categories” A, B, C, D – are based on joint locations in the vessel and stress levels encountered. “Weld Types” (type 1, 2, 3, etc.) describe the weld itself. - All longitudinal welds in shell and nozzles. Category C and D are flange welds and nozzle attachment welds respectively. 12. Compared to Cylindrical shell, thickness of 2:1 Ellipsoidal head is approx. same as shell, Hemisph. head approx. half and Torisph head is 77% higher. 13. MAWP is calculated for: Working condition (Hot & Corroded). Vessel MAWP is always taken at the Top of the Vessel and is lowest of all part MAWPs adjusted for static pressure. 14. Hydro-Test is Standard Pressure test on Completed Vessels. 15. Pneumatic test is performed if hydro is not possible due to design or process reasons. Prior to the test, NDT as per UW-50 is mandatory. Pneumatic test pressure = 1.1 x MAWP x stress ratio, Pressure should be increased in steps (Total 6). 16. Pressure gauge range should be about twice the test pressure. However, in any case it shall not be lower than 1.5 times and not higher than 4 times the test pressure. 17. Vessel MAWP represents the maximum safe pressure holding capacity of the vessel. Vessel MAWP is measured at top-most point and is lowest of vessel part MAWPs, adjusted for hydrostatic head. Total Pr. = Vessel MAWP + h x 0.433. 20. If part MAWP and elevations are known, Vessel MAWP can be calculated by the deducting hydrostatic head from part MAWP. 23. Name plate shows The Code stamping, MAWP, design temp., MDMT, and Extent of Radiography. 24. ASME materials (SA) shall be used for code stamped vessel fabrication instead of ASTM (A) materials. 29. In reinforcement pad calculations, credit can be taken for area available in shell and nozzle. 31. Adequacy of weld sizes shall be checked as required by UW-16. The nozzles construction shall be one of the Code acceptable types. 32. The maximum permitted ovality tolerance (D max – D min) shall not exceed 1% of nominal diameter of vessel. If there is opening, then the tolerance can be increased by 2% x d (d = diameter of opening) if measurement is taken within a distance of ‘d’ from axis of opening. 33. The mismatch tolerances and the maximum allowable weld reinforcement is more strict on longitudinal welds compared to circumferential welds (UW-35). Area removed = Area compensated. Compensation area shall be within reinforcement limits. 35. For use as pressure parts, the plates shall be fully identified. Maximum permitted under tolerance on plates is 0.01” (0.3 mm) or 6% of ordered thickness, whichever is less. 36. All welding (including tack, seal, etc.) shall be done using qualified procedures and welders. 37. Mandatory full radiography in ASME Code Section 8 is required for all welding with thickness exceeding Table UCS-57, and also for lethal service vessels and unfired boilers with Design Pr. More than 50 psig. 38. PWHT is ASME Code Section 8 requirement if thickness exceeds those given in tables UCS-56 (given in notes under the tables). These tables also give min. PWHT temperature and min. holding time (soaking period) based on P-Nos. and thickness respectively. 39. For Furnace PWHT in ASME Code Section 8 , Loading Temperature shall not exceed 800°F, heating rate 400 deg F/hr/inch of thickness, cooling rate 500°F /hr/inch of thickness. Still air cooling permitted below 800°F. During soaking period, temp difference between hottest and coldest part shall not exceed 150°F. 40. Minimum overlap for PWHT in multiple heats = 5 ft.
41. For the ASME Code Section 8 impact test requirement, UCS 66 curve. If MDMT-thickness combination falls on or above the curve, impact testing is exempted. Additional exemptions are given as per UG-20(f) and UCS=68 (c).